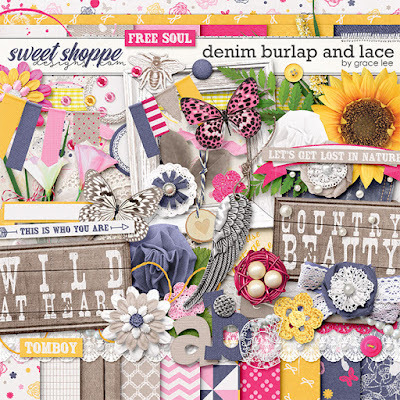 Denim Burlap and Lace is filled with textures and greenery. Whether you want to scrap about a stroll through nature, a country-themed party or a free-spirited child, this kit is sure to have just the right something you are looking for. 63 elements. The elements included are: 1 banner, 1 bee sticker, 2 bows, 1 branch, 2 butterflies, 4 buttons, 1 doily, 13 flowers, 3 frames, 1 glass jar, 1 grass, 2 labels, 3 lace, 2 leaves, 1 milk cap, 1 nest, 2 paint, 1 pearl string, 1 pocket, 2 ribbons, 2 scatters, 1 sprig, 2 sticking, 2 strings, 4 tags, 6 word art, and 1 wing charm.